Sutton knows her native fare is notorious for graying veggies and beyond-recognition meats. She admits that many of the customers who order English dishes at her Brandon Music Café either are Brits themselves or recall favorite meals from trips across the pond. But that hasn’t stopped the restaurant on Brandon’s Country Club Road from winning converts with its blend of food and live performance. Yankee Magazine recognized Brandon Music as “Best Classical Lunch” in this year’s Best of New England issue. Now the 3-year-old business, owned by two expatriates — Sutton and her husband, Stephen — is poised to expand into downtown Brandon. In 2009, Stephen Sutton came to Vermont to start Brandon Music — which then encompassed a recording studio, performance space, store and tea room — while Edna finished overseeing the building of a school in their native Yorkshire. She joined him in the States in the spring of 2011. Not long after, Stephen’s classical music label, Divine Art, had its first big hit, composer Paul Mealor’s “Now Sleeps the Crimson Petal,” which climbed the classical charts after being played at the wedding of Prince William and Kate Middleton. It wasn’t food that initially brought people to sit under the soaring, vaulted ceilings of the converted barn that once served as artist Warren Kimble’s studio. “We started because of the concerts,” Edna Sutton says of the restaurant. “People wanted somewhere to eat before they heard the music.” Since her arrival, Sutton has been slowly adding dishes to the menu as she and her cook, Donna Towle, perfect them. On a recent Thursday afternoon, a glance around the tea-room loft reveals a grand piano facing my table; on my right, shelves hold some of the 300 albums Divine Art has released. Above my head hang stage lights and microphones. They are in place for Left Ear Trio, featuring Michael Smith, the New York City guitarist in town for that week’s BYOB Thursday-night jazz concert. Most Fridays or Saturdays, Brandon Music Café plays host to a classical artist, as well. But diners who come earlier can already sample plenty of British fare. The café serves its full menu from noon to 5:30 p.m. each day but Tuesday, and there is nary a gray vegetable. In fact, most dishes come with a seasonal salad. Currently, halved cherry tomatoes, juicy grapes, pink radish slices and strawberries brighten a pile of mixed greens and spinach. On her way to the table with the salad, Sutton grabs a plate holding three tall creamers, each containing a different homemade dressing. Perhaps in a nod to British salad cream, she recommends the tart and creamy ranch with the composition. For a light lunch entrée, there’s Welsh rarebit. Usually, this dish is composed of toast in heavy cheese sauce, often made by blending cheddar and mustard into a thick, roux-based mother sauce such as creamy béchamel. At Brandon Music Café, the rarebit is more like the English muffin pizza you wish your mother had made. The base is two halves of puffy, chewy English muffin, both topped with ultra-fresh, flavorful tomatoes and melted, aged cheddar dusted with parsley. It’s simple but delicious. Other dishes are more traditional preparations of Brit classics. Just as Americans have a passion for pork, Limeys know their way around a cut of beef. In fact, most of the dishes on the British menu at Brandon Music contain cow in some form. These hearty offerings are no bull. Steak-and-ale pie is richly flavored with Guinness. At first bite, a cube of beef seems too tough, but then it surrenders in tender ribbons of meaty flavor. Mushrooms absorb the stout best, soaking up every bit of malt and just a hint of balancing vinegar. A layer of puff pastry on the tureen fits perfectly, ensuring that there’s never a bite without the buttery crust. 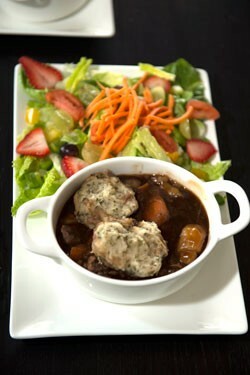 Beef casserole with herbed dumplings is Blighty’s answer to American chicken and dumplings. The shimmering, caramel-colored gravy holds vegetables and meat cooked to perfection. Potatoes are crumblingly soft, while carrots yield just slightly to the tooth. The chunks of meat are even more tender than those in the steak-and-ale pie. But it’s the green-speckled dumplings that give the dish its character. Starting as clumpy biscuits, they combine with the sauce as they soak in it, becoming a moist starch that adds touches of herbaceous flavor to every mouthful. Though Sutton oversees the kitchen, the former social worker does not bear the title of chef. That belongs to Towle, an American cook who previously worked at Green Mountain College and at the Iron Lantern Restaurant in Castleton. The challenges of working together are twofold. Towle is hearing impaired and must read Sutton’s lips to get her cooking instructions and orders. “It’s not a problem as long as I don’t talk to her back,” Sutton says. Towle has brought her own distinctly American contributions. Her award-winning chili, topped with sour cream and corn bread, has been a popular addition, says Sutton. But Towle’s baking skills may be her most valuable asset. Meals come with a petite, three-headed roll that tastes just slightly too savory to be a doughnut. The fluffy bread is a preview of the desserts to follow. Towle’s specialties include a chunky pear cake with pear sauce and Triple Ginger Pound Cake with pineapple cream. There’s a range of British desserts, too. Sutton offers me a pot of black Assam tea to go with a pair of sweets. The tea service comes with dollhouse-size portions of lemon and sugar presented in a pot fitted with a spoon that ends in a G-clef. It’s just one of the quirky bits of porcelain in the room — Sutton also sells rare and vintage china tea ware and British brands of tea and biscuits. She brings the bread-and-butter pudding to the table fresh from the oven. As the name implies, the difference between this dessert and the bread pudding to which most of us are accustomed is that each slice of bread is buttered before being added to the milk and egg mixture that moistens and fluffs it. The pudding isn’t overly sweet. In fact, much of its sugar comes from raisins and dried currants stashed at the bottom. The golden, nutmeg-spotted cube sits in a pool of double cream, which intensifies the buttery flavors. Diners seeking a stronger sugar rush would be advised to try the warm treacle tart. Made of molasses-like sugar syrup, the dish is strikingly similar to Pennsylvania Dutch Shoo-Fly Pie. It’s warm, soft and penetratingly sweet. Fortunately, lemon slices and whipped cream cut through the near-overload of sugar. The combination of food and music has been such a hit that Brandon Music is growing. The café and performance space will remain in the former Kimble barn on Country Club Road, but Stephen Sutton’s phonograph museum and recording studio will relocate to a building in downtown Brandon that the couple has purchased to open as the Compass Music and Arts Center. While part of that space will become a community center operated through the nonprofit Compass Music and Arts Foundation, other areas will house Brandon Music’s live-streaming radio station — up and running by next summer, Edna Sutton hopes — and a small bistro serving coffee, sandwiches and cakes. A 200- to 300-seat concert hall is also part of the long-term plan. This week, the Suttons are headed back to England to renew their visas, which will allow them to stay in the U.S. for two more years. If all goes well, they will open Compass — which they’d hoped to inaugurate last March — soon after. Towle will oversee the new eatery; as for hiring new culinary staff, “demand will dictate how we’ll grow the business,” Edna Sutton says. Judging by the current crowds at Brandon Music, the couple will need to keep renewing those visas — and preparing their home cooking for their adopted neighbors.